The Regional Director of UN Environment Dr Juliette Biao Koudenoukpo identified the inspirational adoption of the Libreville Declaration 10 years ago as the most concrete continental expression of common capacity to transform sustainable development from an abstract concept into a concrete reality. Speaking at the opening ceremony of the 3rd Intermisterial Conference on Health and Environment in Libreville, Gabon, she informed the delegates, that the momentum created in Libreville in 2008 catalyzed unprecedented intersectoral dialogue that culminated in the adoption, by ministers of health and ministers of environment, of the Luanda Commitment, the institutional arrangements for the Health and Environment Strategic Alliance and yielded clear results at the policy, programmatic, institutional levels. A significant set of country driven intersectoral joint actions had a direct impact on communities. 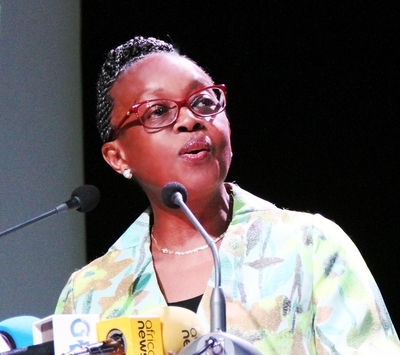 Dr Matshidiso Moeti, WHO’s Regional Director for Africa, underlined how ten years after the first interministerial conference, f the delegates were back in Libreville to take stock of the progress made and agree on a new and dynamic ways to accelerate the implementation of the commitments made then. “In 2015, more than 697 million people did not have access to basic sanitation and more than 600 million people did not have access to handwashing facilities. 404 million people lacked access to safe drinking water, 84% of whom were in rural areas. More than 850 million people use polluting solid fuels for cooking, lighting and heating” she said. She stressed that these traditional environmental problems are exacerbated by global challenges such as climate change, uncontrolled urbanization and population growth and that these challenges occur in the context of economic and social vulnerabilities and a weak health system in most of our countries. She informed the delegates that since 2008, the global development agenda has evolved considerably, to include the sustainable development goals (SDGs), which have given a new impetus to equity and inclusion to ensure that no one is left behind; the Paris climate agreement has also made it possible to redouble efforts to prevent human-induced climate change and its adverse effects on population health and ecosystems. She concluded by emphasizing the importance of WHO’s 13th General Work Programme 2019 -2023 which is firmly anchored in the SDGs and stresses on universal health coverage, managing health emergencies and improved health and well-being.